Playing Wheel Classics 1963-71, Motown, RnB, Northern Stompers. Perfectly suited to The Wheel's music policy (Wheel Classics in the Main room and ATB in room 2), this is a cellar club with 2 rooms, 2 fantastic sound systems, air conditioning, separate toilet facilities and reasonable bar tariff. 3pm-8pm, £5 pay on the door. Future Dates:- Sunday 28th April, Sunday 12th May, Sunday 26th May. Really looking forward to this one!! And as always it's going to be a packer. ONCE AGAIN BLACKPOOL SOUL CLUB COMES TO THE WHEEL IN THE GREAT CITY OF MANCHESTER. With 2 great guest DJ's ROD ALLSWORTH AND JIMMY SCRIV playing great set's in both rooms. I spoke with Jimmy Scriv and Tim Rabjohn on the telephone last night, who told me it's gonna be another packed Basement at the next Sunday Soul Session at the Legendary Twisted Wheel Club on 14th April. Just over a week to go...... and counting for our next Superb Sunday Soul Session at the and only Wheel. And Big News coming over the Wheel date on August 25th ? 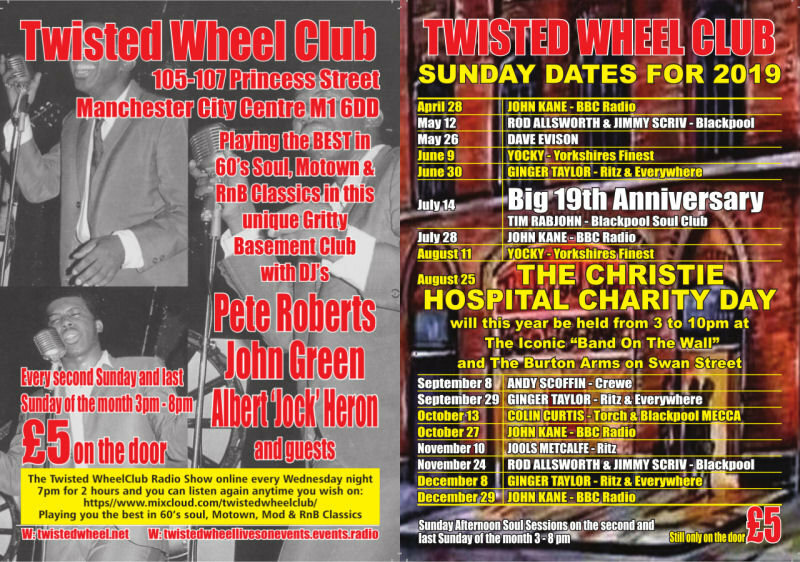 That's laughable, "The Legendary Twisted Wheel Club" celebrates its 19 continuous years in July of its 2nd coming. And we have been doing it twice a month. As you already know. THE TWISTED WHEEL CLUB IS IN MANCHESTER!! .... NOT SALFORD , AND JUST IN CASE YOU DIDN'T KNOW ? SALFORD IS A CITY . Oh, and how could you forget our unique Basement Club with a fantastic atmosphere that hits you like a train!!! when you walk down the stairs. And our 100's of Wheel Regulars who travel the length and breadth of the UK just to come to Wheel in Manchester twice a month. Looking forward to seeing you all on Sunday, and don't be fooled by others. Yes another fantastic "Sunday Soul Session" is guaranteed for you at the Wheel in Manchester as always! 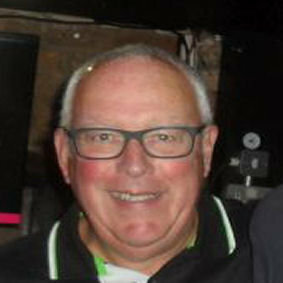 Our great guest DJ's - JIMMY SCRIV & ROD ALLSWORTH and the BLACKPOOL SOUL CLUB are on their way. Safe journey up from Shropshire to you both. WILL BE DJ'ING AT THE LEGENDARY 'BAND ON THE WALL" & 'THE BURTON ARMS"
Had lots of interest and phone calls inquiring about The Twisted Wheel Club doing the BAND ON THE WALL. THE CHRISTIE CANCER HOSPITAL IN MANCHESTER, KNOWN AS ONE OF THE BEST IN THE WORLD. And what a fantastic venue the "BAND ON THE WALL" is, it's a massive Legendary Manchester Music venue with its 100's of years of Manchester History. Looking forward to be working on what will be a very, very well supported day, for a great charity. Some Photos of the Iconic "Band On The Wall"
We're in Southport on that date for another charity event but we'll be with you in spirit and making our own donation to The Christie, with whom there is a family connection. Thanks very much Paul & Diane, looking forward to seeing you both on Sunday in Manchester at The Legendary Twisted Wheel Club. "THE COLLYHURST KID STRIKES AGAIN"
There's only ONE Wheel, and it's on this Sunday!...... In the Big City of Manchester. Living for the Weekend is an understatement!! 10th April Twisted Wheel Radio was absolutely Fantastic by the way, just like the guy who does it !! As you know the Radio Show is just like the Club itself with no tricks or lies, just great music. See you on Sunday at The Legendary Twisted Wheel Club in Manchester!! And like everybody knows the Wheel celebrates its "Big 19th Anniversary" on Sunday 14 July, of it's second coming!! AND YES CAN YOU BELIEVE IT'S "19 FANTASTIC CONTINUOUS YEARS AND TWICE A MONTH" PLAYING WHEEL BACK CATALOGUE RECORDS. Looking forward to Sunday for another unmissable soul session in this Unique Atmospheric Gritty 60's Basement Club in Manchester. Playing the back catalogue of Wheel records that made the Club so famous. Yes, all roads and trains lead to Manchester tomorrow for the Wheel. And the Club is in Manchester!! Not somewhere with an M postcode ? funny when people say there from Manchester when it suits? THE COLLYHURST KID AND PROUD OF IT. Well today's the day that 100's come to the Metropolis for the "Legendary Twisted Wheel Club" and I think 19 continuous Years and twice a month, says it all. Today we have got 2 fantastic guest DJ's on for you JIMMY SCRIV AND ROD ALLSWORTH who will be playing great set's guaranteed for you in both our fantastic rooms. Along with myself, there will be resident DJ's JOHN GREEN & ALBERT HERON in this fantastic unique atmospheric 60's Basement Club with an Atmosphere that hits you like a train when you walk down the stairs. Looking forward to seeing you all again at the ONE and ONLY "Legendary Twisted Wheel Club" in Manchester. 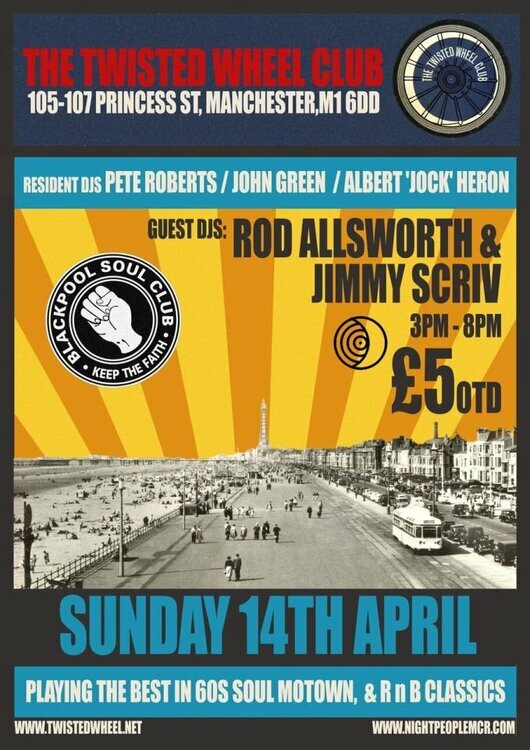 And don't forget our next Superb Sunday Soul Session at The Legendary Twisted Wheel in Manchester. On Sunday April 28th it's BBC RADIO DJ - JOHN KANE, CELEBRATING HIS BIRTHDAY AT THE WHEEL. And what a fantastic packed to the rafters day that's going to be as always, in the place that he loves. What a fantastic afternoon. Thanks for the invite. Loved it. The Original is Still the Greatest. “65 to 71 Whitworth Street has gone”. 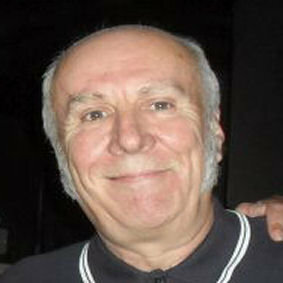 Pete Roberts is the Saviour of Soul Music in Manchester and never forget it. Thanks very much for your very kind comments. telling me how people on THE TWISTED WHEEL LIVES ON Facebook site are raving about how good the Wheel was yesterday!! With over 40 fantastic comments and photos of the great day. And you and the 100's of people who travel to the Twisted Wheel Club in Manchester, can honestly testify. Looking forward very much to our next Sunday Soul Session on 28th April with BBC RADIO DJ - JOHN KANE. Loved it thanks for having us Pete Roberts. The Wheel goes from strength to strength. Thanks Jimmy, and you and Rod did a great job for us at the Wheel on Sunday!! As always.